SPW019489 SCOTLAND (1927). Carntyne Greyhound Racecourse, Myreside Street, Glasgow. An oblique aerial photograph taken facing west. Title [SPW019489] Carntyne Greyhound Racecourse, Myreside Street, Glasgow. An oblique aerial photograph taken facing west. Parkhead Forge Tram roughly about here. Bridgeton Waverley in its latter days played some fixtures here at Carntyne Stadium before ceasing to exist in 1962. Former Shettleston Road Employment Exchange, this building still exists today and was awarded Category 'B' listing in 1992. The address may be Myreside Street, but it appears that the street has yet to be extended past the northern boundary of the stadium. Carntyne, around the time of opening. Built on the site of a former trotting track, it staged its first greyhound meeting during the month of this photograph. 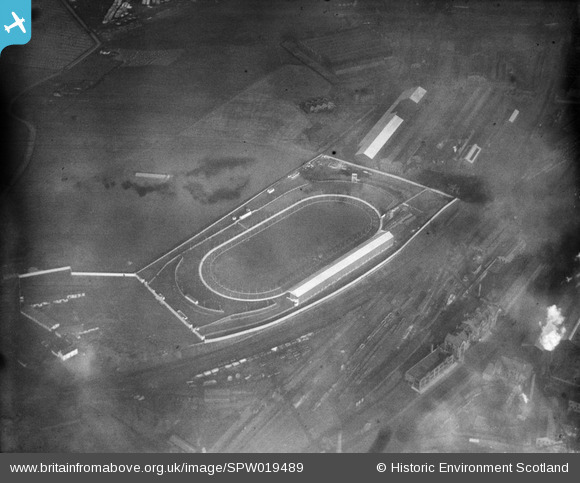 The following year a speedway track was constructed inside the dog circuit but did not prosper. The dogs survived until 1972.